For many students a typical academic education may not be the route to success after GCSE, but with courses like Performing Arts BTEC available, it doesn’t have to be. Providing students with a more practical way to gain the equivalent of three A-Levels, and a possible place at university if they so choose, the South West College course has been revamped under the watchful eye of actor and lecturer, Brian McMahon. As well as music and dance, students will also have the opportunity to showcase their skills in a performance at the Burnavon and audition for industry professionals. And with such high profile shows such as Game of Thrones and Dracula being shot in Northern Ireland, Brian said there are more and more opportunities for young people in the arts. “It is a two-year course, the equivalent of three A-Levels and can be changed to UCAS points if someone decides they wanted to progress on to university,” he explained. “The course itself is very diverse and is made up of different modules needed to progress within performing arts... the likes of performance workshops, acting techniques, script writing, business and music. And with his background in theatre along with his B-Dramatic workshops in schools and groups across NI, it seems he is the perfect fit to help students follow their performance dreams. “Performing arts can do so much for you as an individual, without progressing as an artist, from the likes of confidence to just being able to get up and talk and hold your own,” Mr McMahon added. To gain a place on South West College’s BTEC Level 3 Extended Diploma in Performing Arts, students can apply up until the end of August. 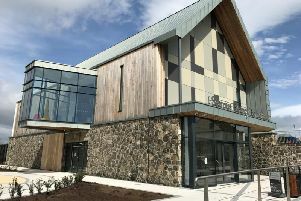 Based at the Cookstown campus, the course will build on a strong interest in Performing Arts to develop skills preparing students to progress to Higher Education or enter the industry directly. The course is practically focused and entry Requirements are four GCSEs, above grade C and to include Maths and English. A place is also subject to an interview and audition.